Before I go on about cakes and convince you that today is International Cake Day or something (in my opinion, though, EVERYDAY should be Cake Day) what I actually mean to say is today I'm hosting an author who wrote a book on CAKES! (And Depression, and anxiety and death) but, come on, cakes are the most important, right? So please welcome the LOVELY Shari Goldhagen, with her new YA Novel, 100 Days of Cake, who has SUPER graciously written about cakes in the book that gave me foodgasms, and her inspiration/ backstory in using these cakes! I must confess, I don’t really have much of a sweet tooth. If I were following some sort of cooking challenge like Molly’s mom does in the book, it would probably be 100 Days of Pizza. 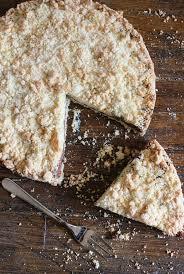 Don’t get me wrong; I’m a huge fan of crumb cake—well at least the crumb part. But it’s always struck me as one of the most sensible of cakes. It’s very utilitarian; we have it at office breakfast meetings next to a bowl of fruit. I started to wonder just what could make a coffee crumb cake crazy. I’m pretty sure it would be just the crumbs. . .stuck together. . .with none of the cake. My husband is shaking his head at me saying that would never work because you need balance. Balance schmalnce! For U.S. 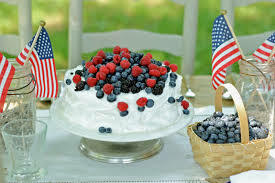 Independence Day, it’s pretty much required by backyard cookout law that someone frost a sheet cake white and then fashion the American flag with strawberries and blueberries. I tried this once and ran out of room with my strawberry stripes—I ended up with nine original colonies instead of thirteen, but they were still pretty tasty. 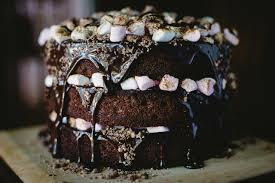 For someone who hates camping and generally finds marshmallows off-putting, I have an odd love of S’mores and am a huge sucker for any sort of choco-mellow-graham dessert. I have yet to encounter one that’s an actual explosion, but, if we can dream it, we can do it, right? When I was a kid this was a big thing other people’s mom’s would do (much like Molly’s mom pre-cake challenge, my own mother was more of a order take out kind of cook). You crumble up chocolate cake in a flowerpot so it looks like dirt, and have gummy worms “crawling” around. This always seemed a little gross, but I so totally wanted one. An ex-boyfriend’s mom made this for Christmas; it may have extended our relationship a few months. 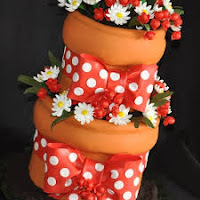 The cake is so often the visual showstopper at a wedding. People gather around it to ohh and awe and debate what flavor it is inside. But by the time the happy couple is smushing cake into each other’s faces, I’ve usually already eaten my weight in passed hors d’oeuvres, my heels are long gone, and I kind of want to go home. Like, can they cut the darn thing already??!!! Wouldn't it be great if you could have that sort of monumental cake on some random Tuesday instead? 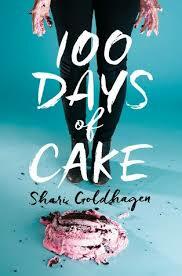 Shari Goldhagen is the author of the novels IN SOME OTHER WORLD, MAYBE (St. Martin’s Press, 2015) and FAMILY AND OTHER ACCIDENTS (Doubleday, 2006), and the YA novel 100 DAYS OF CAKE (Atheneum, 2016). A fellow at both Yaddo and MacDowell, Shari writes about pop culture, travel and relationships for publications including Salon, Cosmopolitan, Us Weekly, Life & Style Weekly, and DaySpa. She lives in NYC with her husband and daughter.